Making Pressure Cooker Cheesecake is a piece of cake. 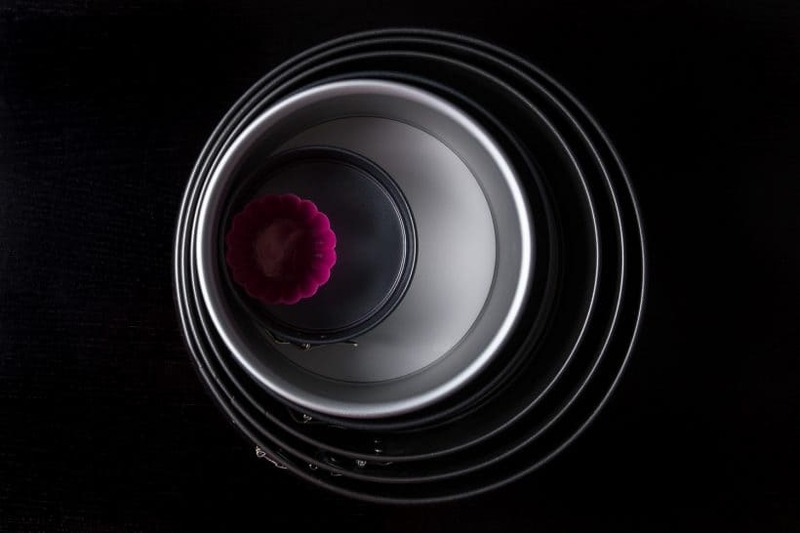 To make it almost perfect in the pressure cooker is another story. I would be lying if I told you our first pressure cooker cheesecake was stunning. In fact, it took us 16 tries. Imagine the excitement on my mother’s face when she received her share of our 16th cheesecake in 2 months! An almost perfect pressure cooker cheesecake should look and taste great. Relatively smooth surface and side with minimal air bubbles. 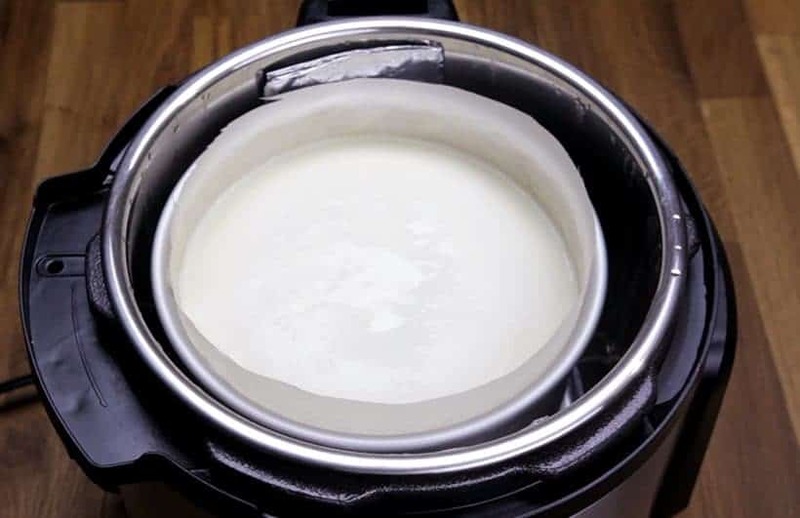 Whether you’re here to learn about perfecting your pressure cooker cheesecake or to find answers for making a better pressure cooker cheesecake, these 11 tips will answer most of your questions. Why Did My Cheesecake Crack? Both Fat Daddio's Cheesecake Pan (with removable bottom) and non-stick Springform Pan are great for making pressure cooker cheesecakes. The pink silicone cups from IKEA are great as well. What Sizes Fit In The 6 Qt. 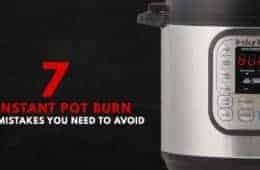 Instant Pot DUO60 Pressure Cooker? In US, 1 package of Philadelphia Cream Cheese Block is 8 ounces (226g). In Canada & Australia, 1 package of Philadelphia Cream Cheese Block is 250 grams (8.82 oz). 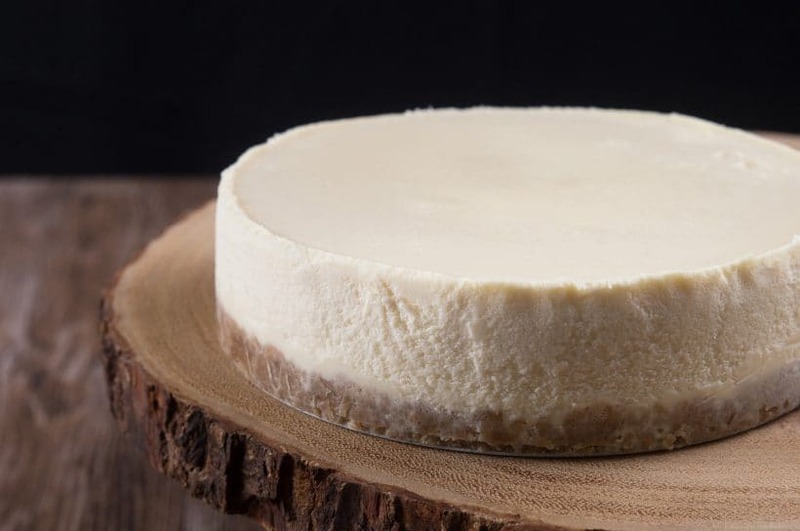 Despite the name, cheesecake is more of a custard on a crust than an actual cake. Four Essential Ingredients: cream cheese, sugar, sour cream, and eggs. Cornstarch: Adding a small amount of cornstarch to the cheesecake improves the overall texture without changing the flavor profile. It also helps prevent the cheesecake from cracking. Room Temperature: The secret to a lump-free cheesecake is to start with cream cheese, sour cream, and eggs at room temperature. *We will elaborate on this in the techniques section. Lining the container with parchment paper is not crucial for great tasting pressure cooker cheesecake. But if you want a smoother finish and cleaner release (especially with Fat Daddio’s Pan), we recommend lining the container with parchment paper on the bottom and the sides. From our test results, silicone cups from IKEA do not need to be lined with parchment paper. Freezing vs Blind-Baking: We did a direct comparison between the two different methods. In our blind taste test, the baked crust was noticeably firmer and crisper when compared to the freezer version (method 1). If you like a crisper crust, we highly recommend baking the crust in the oven for 15 minutes at 325°F. On a side note, noticed the air bubbles on the surface? We will tackle that in a bit. To get a more even crust layer, use flat objects such as measuring cup or container to firmly press down the crust. Use a small spoon for the edges. We always see recipes telling us not to overmix the pressure cooker cheesecake batter. But why? Speed: Slow speed, medium speed, high speed. Duration: 30-seconds duration, 1-minute duration, 2-minute duration between each ingredient. Never Mix with High Speed: High speed mixing adds too much air and shears the proteins in the batter. 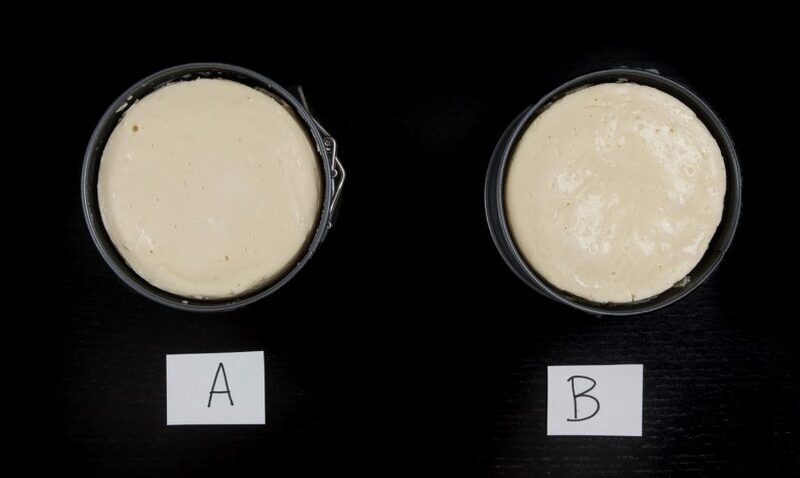 Don’t Mix the Batter for Too Long: We were able to control the density and creaminess of the cheesecake by controlling the time we used to mix each ingredient. -The longer we mixed the cheesecake batter, the more tender the cheesecake became. However, when you mix the batter for too long, the batter becomes too runny and may cause the cheesecake to crack. Cracked cheesecake due to overmixed batter. Remember: the less you mix the batter, the firmer the cheesecake will be. Add room temperature cream cheese in a medium mixing bowl, break up the cream cheese by pressing it with the mixer. Mix white sugar, cornstarch, and sea salt in a small mixing bowl and add the mixture to the cream cheese. Mix at low speed until everything have incorporated. Scrape down the sides and the mixer with a silicone spatula. Add sour cream, vanilla extract to the cream cheese mixture and beat until incorporated using low speed. Scrape down the sides and mixer with a silicone spatula. Blend in the eggs using low speed, one at a time. Mix until incorporated (about 15 – 20 seconds with a hand mixer). Try not to overmix on this step. Add room temperature cream cheese in a medium mixing bowl, beat cream cheese over low speed with a mixer for 2 minutes. Scrape down the sides and the mixer with a silicone spatula. Mix white sugar, cornstarch, and sea salt in a small mixing bowl. Add half of the mixture to the cream cheese. Mix at low speed for 1 minute. Scrape down the sides and the mixer with a silicone spatula. Add the other half of the sugar mixture to the cream cheese. Mix at low speed for a minute. Scrape down the sides and the mixer with a silicone spatula. Add sour cream and vanilla extract to the cream cheese mixture and mix at low speed for another minute. Scrape down the sides and mixer with a silicone spatula. Cause: Overmixing the eggs create a lot of air bubbles. Prevention: blend in the eggs one at a time until incorporated. It should only take 15 – 20 seconds per egg with a hand mixer. Tapping the Cheesecake against the counter-top will cause the air bubbles to rise and pop. Swirling the cheesecake will also cause the air bubbles to rise and pop. Use a fork or toothpick to remove all the air bubbles on the surface. Cornstarch: Adding cornstarch to the batter also helps prevent the cheesecake from cracking. Cheesecake will continue to shrink in size during the cooling process. If the cheesecake happens to stick to the sidewall of the container, the cheesecake may crack. 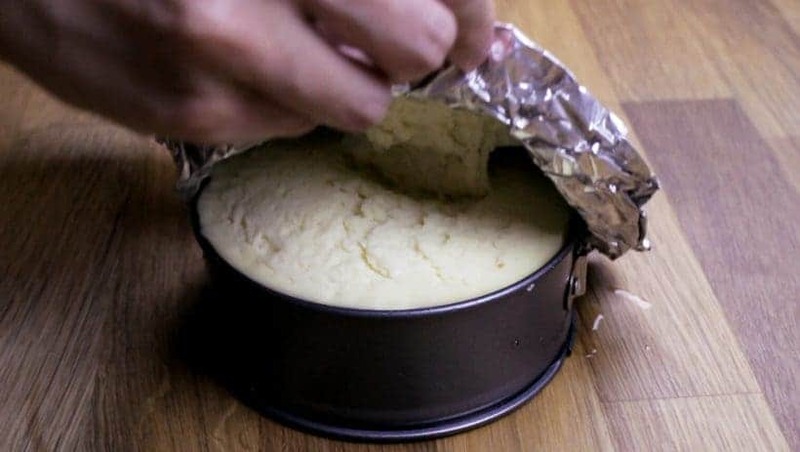 Solution: After cooling for 10 to 15 minutes, carefully run a thin paring knife between the sidewall and the cheesecake or parchment paper to release the cheesecake from the container. We recorded the temperature inside the pressure cooker during our experiments. There’s a sudden shift of temperature when we opened the lid. The steam rushing out of the pressure cooker causes the temperature to rapidly decrease from 192°F to 126°F within a few seconds. This sudden shift of temperature causes the expanded cheesecake to rapidly shrink. If the cheesecake was slightly under-cooked, cracking may occur. Solution: open the lid very slowly to allow the temperature of the cheesecake to decrease more gradually. Cause: Condensation build-up happens during the “going up to pressure” stage and natural pressure releasing stage. Method #1 – Aluminum Foil: One option to avoid condensation is to wrap the cheesecake tightly with aluminum foil. With this method, you will need to increase the cooking time by ~30%. 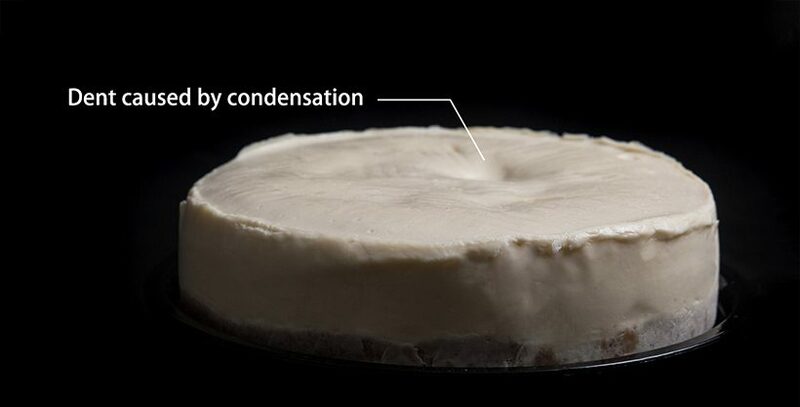 With some elementary scientific calculations, we found that the dents on cheesecakes’ surfaces are mostly caused by the condensation build-up during the “going up to pressure” stage. So, we came up with a second method. 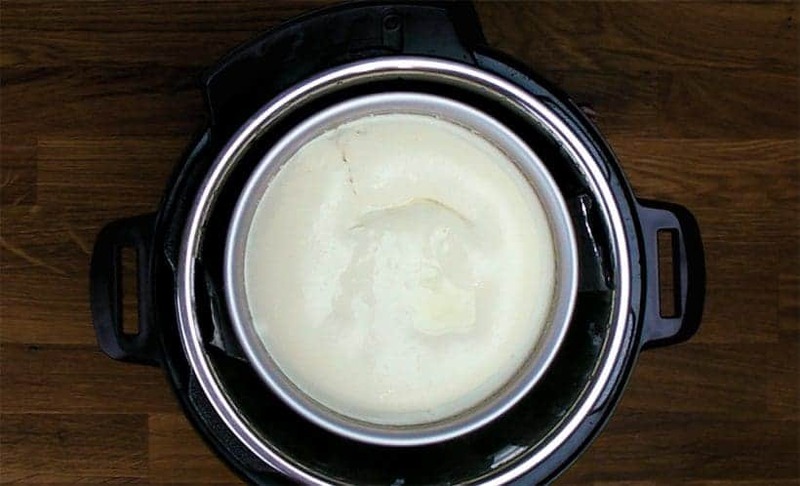 Method #2 – Start with Boiling Water: For a smooth surface cheesecake, wait until the water in the pressure cooker boils before placing the cheesecake in. Once you close the lid, the floating valve should go up quickly and pressure will be achieved in less than 1 minute. You will have to add 2 -3 minutes to the pressure cooking time to compensate. 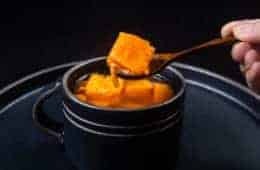 At this point, you can remove it from the pressure cooker or just leave it in the turned off pressure cooker and let it come down to temperature more gradually with the lid open. Whether you’re lining the bottom with parchment paper or using a non-stick pan. After chilling the cheesecake in the fridge, the bottom of the cheesecake will stick to the pan. Why? Because the butter has hardened. I would love to make the Perfect Pressure Cooker Cheesecake, but I think my mother will start to hate me with Cheesecake #17. Craving more? Subscribe to Pressure Cook Recipes to get our newest recipes & cooking tips delivered straight to your inbox. How long does it take for cream cheese and sour cream and eggs to reach room temperature? This is my first try at cheesecake. Cream cheese and sour cream will take roughly 1 – 1.5 hours. Egg will take roughly 30 minutes. I’m a newbie IP person and would love to use your recipe for my first cheesecake however my son needs GF so can this be made crustless? I don’t have any GF grahams or gingersnaps on hand I want to make this like… NOW (lol)! Just finished my first piece of PC cheesecake and it was delish!! I’ll be making another for my brothers that are visiting but have a question about texture/cook time. I have a 7×3 fat daddio cheesecake pan and I actually misread the directions and PC for 31 min instead of 25-27. Still delicious, used the creamy version, however, the texture inside was like a soft custard and the edge was more like a firm cheesecake that I’m used to. Sooo…..was it over cooked or undercooked? Ingredients were room temp per directions and mixed accordingly. I’m not sure what the creamy vs dense version is comparable to? Any help is appreciated….either way I’m making again! Thanks so much! It sounds like the cheesecake was undercooked a bit. Was it cool down completely before placing in the fridge? I have used this recipe many times with great results, but I would like a taller cheesecake. I’ve read through the questions and answers and found similar but not my exact scenario. I apologize in advance if I missed it. I have a 6 qt Instant Pot and a 7 x 3 push pan. If I increase the recipe by half (using 24 oz of cream cheese), how much extra time should I cook it? Will it also take longer to npr? Are there any other considerations with this deviation? Thank you so much for sharing your expertise with the public. You can make 1.5 times the batter and the cooking time will increase by roughly 5 – 8 minutes. No other changes are needed. Hi! 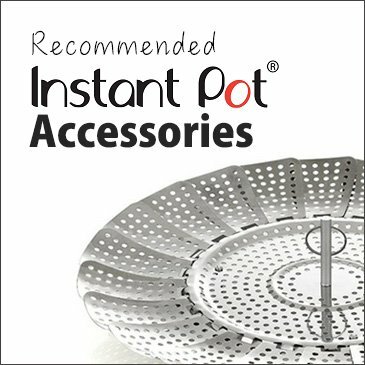 Do you use the taller steamer rack or the trivet that comes with the Pot? Could I use the Oxo silicone sling, or does the cheesecake pan need to be up higher? Thanks! Thank you for your question. It will need to be up higher as you don’t want the cheesecake pan to be touching the water. I plan to make a 1 1/2 recipe using the 7 x 3 Fat Daddio pan. I read that you suggest adding 8 to 9 minutes cooking time when people do this in an 8 x 3 pan. Will it be essentially the same cooking 1 1/2 recipe in the 7 x 3 pan or a little longer? Thank you. Yes, it will be roughly the same! On a side note, I don’t think the 7×3 pan will fit all of the increased ingredients. Thank you for the caution re using 1 1/2 recipe for 7 x 3 pan. I’ll use just 1 recipe amt. Would this recipe work in 1/2 pint ball jars? I would put crust in and tap it down. The filling would then be added leaving enough room for a topping to be added before serving. I am clueless – how long would these jars need to be cooked? Thank you for advising me. I only have 3qt and do so want to make these. I will say roughly 15 minutes and natural release. Make sure not to tighten the jars with the lids as they can crack under pressure. Thank you so much for sharing the results of all your hard work! Curious about your tip of letting the water boil before putting in the cheesecake. Would this be done on the saute setting? Thanks again! The saute setting will work best! Hi! I’ve made cheesecakes in my IP using your recipe & my family loved it 🙂 Thank you for coming up with the recipe. I was just wondering though if it’s possible to use the same recipe but in the oven? If yes, what’s your recommended temperature & for how long should I bake it? Appreciate advice you can give. Thanks! The cooking time will be roughly 1 hour – 1 1/2 hour at 350F. I only have an 8-1/2” x 3” springform pan and I want to make a large cheesecake for an upcoming party. I assume you will be using a 8 quart pressure cooker for this. I have made your cheesecake multiple times with great reviews. Do you know if your recipe freezes well? My cheesecake turned out very rubbery, what did I do wrong? I used a 9” springform pan, was it just too big? Was your cheesecake very thin. It is possible that you have overcooked it due to the larger pan. Thanks again for all your work to make me a better “instant pot” user. I’m making a crust less cheesecake this time to use as the filling of a cake. I had never even attempted to make a cheese cake, but my daughter bought me an instant pot and insisted on me trying! Several of her friends were making instant pot cheese cakes…turns out we ALL were using your #17 recipe!!! 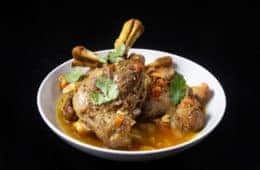 Hello, thank you for sharing this recipe! I tried to make it today but the cheesecake appears to have exploded in my instant pot. Do you have any idea why this may have happened? Thanks! It sounds like too much air has gotten into the cheesecake batter during the mixing steps. I have just made my first IP cheesecake from your recipe. It was easy-peasy and your detailed instructions were especially helpful. One thing you do not address is whether you chill it in the fridge covered or uncovered? And if covered, with what? Thanks so much! Can’t wait to taste it tomorrow! Covering with food wrap will work better as it will not dry out the cheesecake. We cut out the parchment paper to make it fit better. Hello. I am going to try to make a chocolate cheese cake. 1) I noticed you said use corn starch – is this in place of the flour? 2) The recipe says use a food processor – I thought your’s said hand mixer – help? 3) You suggested using a aluminum foil sling – can I use the silicon one I have? 4) To add ganache – do you wait until it’s been refrigerated overnight? 1) Adding corn starch will give a firmer texture to the cheesecake. 2) Our recipe says hand mixer for the batter. Food processor is only for the graham crackers. 3) Silicon one will work as well. You may want to add 1 – 2 extra minutes as it can prevent steam from cooking the cheesecake. The recipe should work just fine. I am about to begin my adventure with cheesecake in my Instant Pot and have a question, would there be any adjustments needed for a 7 x 2.3″ springform pan? 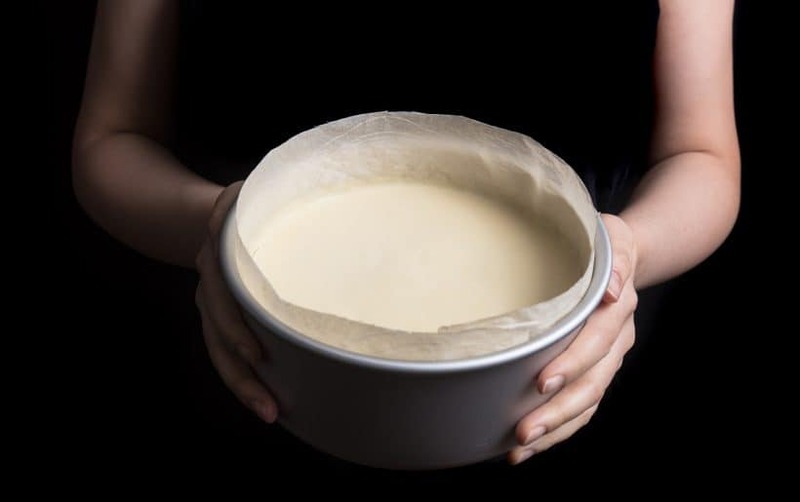 You may not be able to pour all the batter into a 7″x 2.3″ springform pan. I would recommend decreasing the cooking time by 2 minutes as the cake will be thinner. 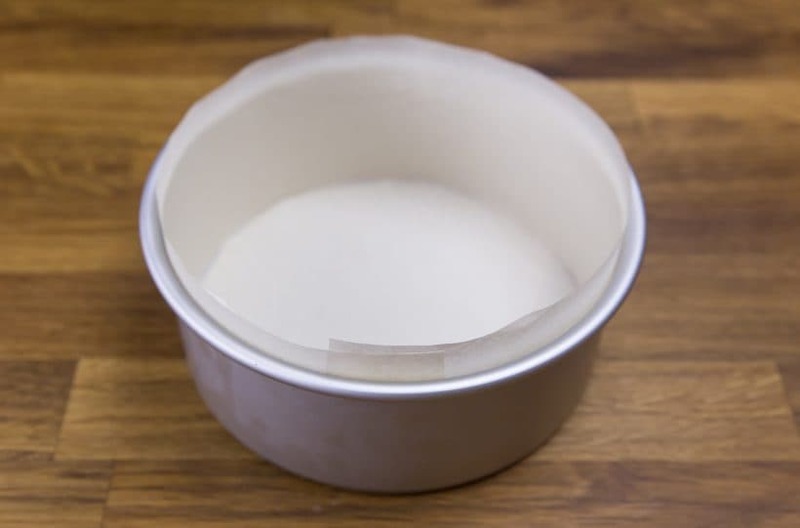 Amy, how do you keep the “overlap” of the rolled parchment paper on the side of the pan from shifting? In your picture it looks like it is affixed with something to keep it in place. We used a little melted butter as glue to stick them together. Hi, I just put my cheese cake into the instant pot! So glad I found your site with all these great tips. Will add a further comment after we try it tonight! I made the cheesecake in a springform pan. First one came out perfect. Second one not so much. Upon opening my instant pot, it looked like the cheesecake exploded! It was all over. Any ideas what I did wrong? Thank you so much. I love your site! Sorry for the late reply as this message somehow went into the spam section. thank you for your question. It sounds like too much air got into the cheesecake batter when mixing the egg. I am new to pressure cooking. Am going to try the cheesecake recipe. Would love to be able to print your tips for making a great cheesecake. Is this possible? We don’t have this feature for our tips article yet. My question is this….i have 8, 9, and 10 inch spring form pans. If i follow your recipe for the 7 inch but cook it my 8 inch pan, do i keep all ingredients the same or do i need to increase? Also, what about cooking time for the larger pan size? You will want to 1.5x the recipe or the cheesecake will be quite thin. The cooking time will have to be increased by 5 – 8 minutes. I can’t find a 7″ springform pan anywhere near me so I want to use some small Pyrex dishes I have instead. They’re 1 2/3 c (390 ml) each and I have 4. How do you think I should adjust the recipe and time to account for their size? The adjustment will depend on the recipe. I have the Instant Pot springform pan with the glass bottom and silicone sides. Should I line the bottom and sides with parchment? Would the cooking time be the same? That is a interesting springform pan! I think you should line the bottom. The sides will be fine. The cooking time will probably need 1 – 2 minutes longer. This is simply amazing. I wish I had the time and resources to perfect my recipes so methodically. It would be so much fun! I have a keto instant pot cheesecake recipe that I would like to adapt to your method. It is a thick, 6″ cake, and I have a 7″ pan. Based on your research, it stands to reason that I should shorten the recommended cooking time by 5 minutes? Yes, I would say 3 – 5 minutes. 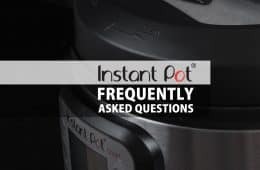 As a new instant pot owner, I am entranced by your web site. The attention to detail, great pics and feedback have me returning over and over. Thanks for the time and effort you put into this endeavor. It is much appreciated. I have an 8qt instant pot with a 8″x3″ fat daddio cheesecake pan. Should I double the recipe and cook double the time? I would 1.5x the recipe and increase the cooking time by 8 – 9 minutes. I am going to try my first cheesecake in my IP, but I am not sure of the best way to line the pan. I do have the Daddio’s pan and some parchment rounds. 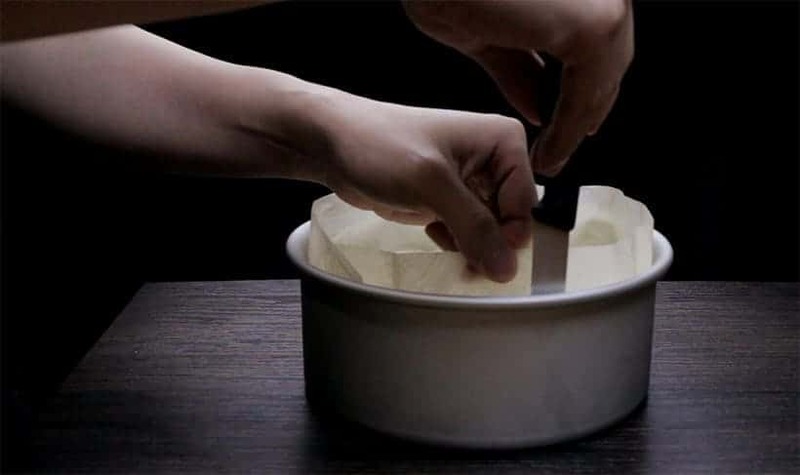 Do you line the bottom and sides with one continuous piece of parchment, or can I lay down the round and then wrap a strip of parchment around the sides? I do have plenty of rolls of parchment, but I can’t tell by the photo how to line my pan. We lined the bottom (one round piece) and the sides (wrap with a strip of parchment paper) with 2 pieces of parchment paper. Hi, I’m very making mi first cheese cake… I have a question related to the amout of cornstarch. It says 2 tablespoons (30 gr?) or is it 1 tablespoon (15 grams? Can I use Greek yogurt in place of the sour cream? Would I have to make any adjustments to the recipe/cooking times? Would it gave a similar taste and texture? I think the cheesecake will be more tangy with Greek yogurt. Made my first cheesecake today. The outside was dense and firm but the centre was very, very creamy. I used a 6 x 3 pan and set for 33 minutes. However, a small part of the foil sling blocked the sealing so I had to open it, fix it and restart it. Because it had been on for about 4 -5 minutes I reset the time to 31 minutes. Should I just have left it at 33 minutes? It tasted delicious – just not a consistent texture. It sounds like the center is undercooked from your description. I would say it probably needed a few more extra minutes as the small part of foil sling probably caused water in the pot to evaporate. 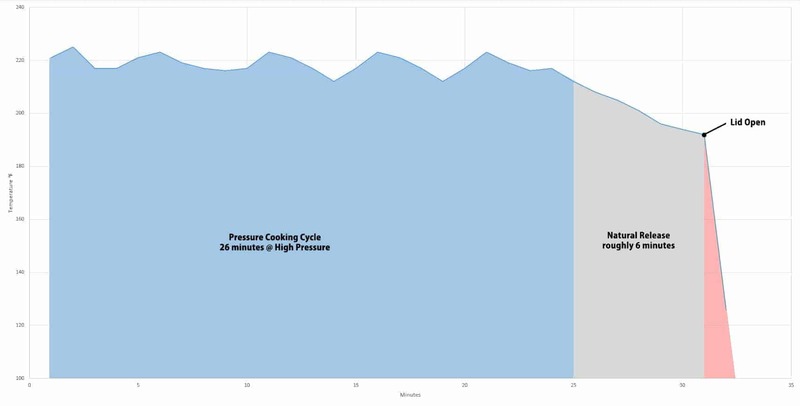 As a result, the get up to pressure time and natural release time were also shorter due to less water in the pot. It should work. I would think the cheesecake will come out slightly more dense. HI there, I’m so excited to try this and thanks for the tips! I have a 6 x 3 springform pan, the bottom doesn’t come off. Will this work if I use parchment paper? I just ordered a 6×3 Fat Daddio pan with removable bottom. Which recipe amounts and time should I use? The 7 X3 or 5×3 instructions? Your testing sounds very precise and scientific and we thank you, but I guess you did not test on a 6×3 pan. Thanks is advance for your response, we love your site, recipes and hints! The recipe amounts can stay the same, but the pressure cooking time will have to be increase by 5 minutes due to the increase in thickness. Thanks for your blog! I have an 8qt Instant Pot and 8″ Fat Daddios Cheesecake Pan, so do you have any suggestions for what to increase ingredients and/or time to? 3 packages of cream cheese maybe too much for a 8″ Fat Daddios Cheesecake Pan. I would keep the ingredients the same for the first time. If there are still a lot of space left, I will increase the ingredients by 1.5x next time. If you are keeping the same ingredients, you can decrease the pressure cooking time by 2 minutes as it is now thinner in a 8″. If you have increased the ingredients by 1.5x, increase the pressure cooking time by 8 minutes. 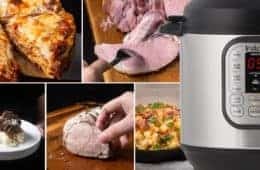 Can I use this recipe for regular pressure cookers? How many pounds pressure should I use? I would love to try this recipe. I will reduce the cooking time by about 2 – 3 minutes. It is not necessary to add sour cream to the cheesecake. It just adds creaminess to the cheesecake and balances the overall taste. I used the aluminum foil method when making flan and it came out perfectly. But I want to experiment with the boiling water. 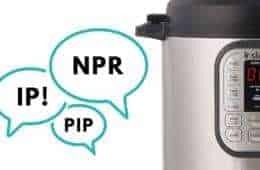 I’m new to pressure cooking and I’m still getter by to know my instapot. Thank you? You can bring the Instant Pot to a boil by pressing the Saute Button. Thank you so much for the detailed info and pictures! I will actually try this recipe?I love my new Instant pot! This level of testing and detail reminds me of Heston Blumenthal doing his “In Search of Perfection” series. Well done on another great recipe. thank you so much for your kind words and high praise! Jackie, this is a great article derived from your experiences. Thank you for sharing! I have a 6 inch springform … how long for cooking? The cooking time is mostly determined by thickness. Would you happen to know how tall is the 6″ springform pan? the cooking time will most likely be a few minutes longer than 7″ x 3″ cheesecake. I would start with 28 minutes + natural release.